Whether you live near the beach or just wish that you did, you can bring the feel of coastal living into your home with the coastal farmhouse design. Your home should be a sanctuary of warmth, comfort and serenity, and this popular style can give you that and more. The look is simple to achieve by using a palate of coastal colors and some creative design elements. You can easily transform your home into this style with a few elegant pieces. The coastal farmhouse style is an exciting blend of two current home decor trends: farmhouse and coastal. The farmhouse style mixes elements of the old and new, using wood, metal and distressing to give your home a clean, traditional look. The coastal style brings elements of the seaside into your home and creates a mood of peace and tranquility. These two styles together are perfect to bring a fresh, calm atmosphere to any home. The design pieces below can help you easily achieve this style in a big way with minimal effort. Just sprinkle a few of these elements throughout your home and enjoy the beach life all year long. This living room effortlessly brings in elements of the coastal farmhouse style. The gorgeous coffee table uses wood and metal, a common blend of the farmhouse style, while the lighting fixture utilizes a more coastal style of wood. The aqua details on the chairs, pillows and jars give the room a cool, airy feel. 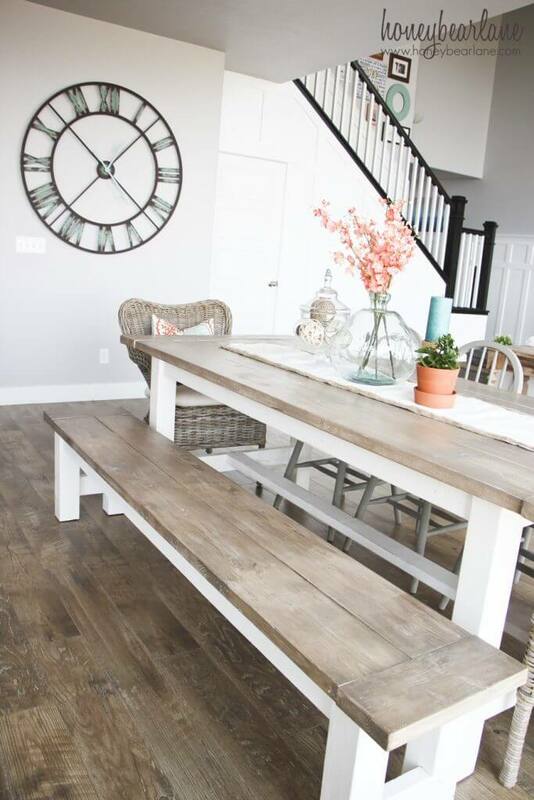 Nothing brings the farmhouse style to your dining area like a farmhouse table. 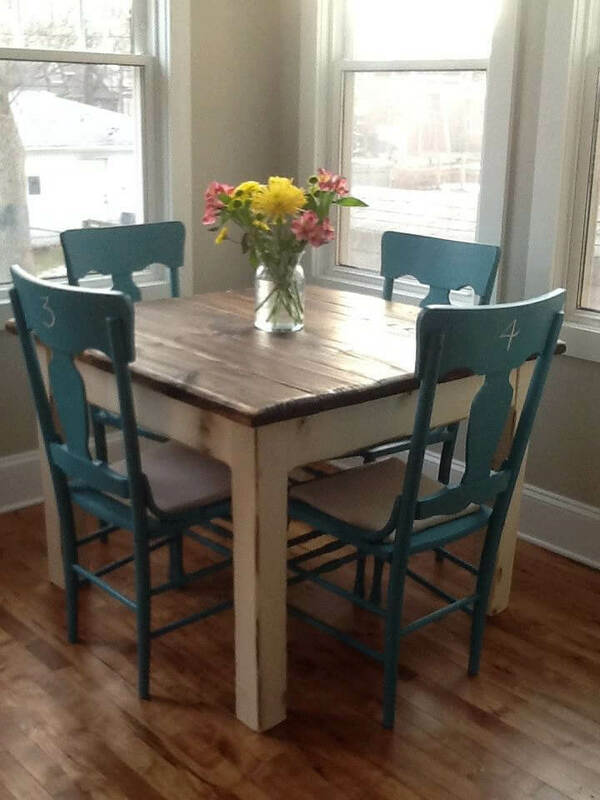 These tables can be quite expensive if purchased at a furniture store, but you can easily build one yourself. This beautiful white and stained table is a perfect for your family to gather for meals and game night. Adding cool colors and beach greenery brings in the coastal feel. If you want to bring the beach to your farmhouse kitchen table, you can create a beautiful table spread featuring coastal details. 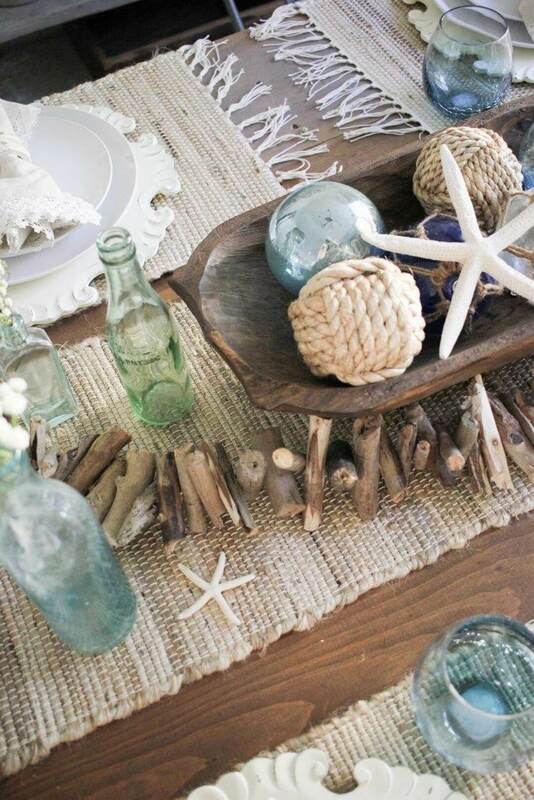 Beachwood, sea glass, rope balls and woven fabrics all come together to create a lovely beach design for your table. 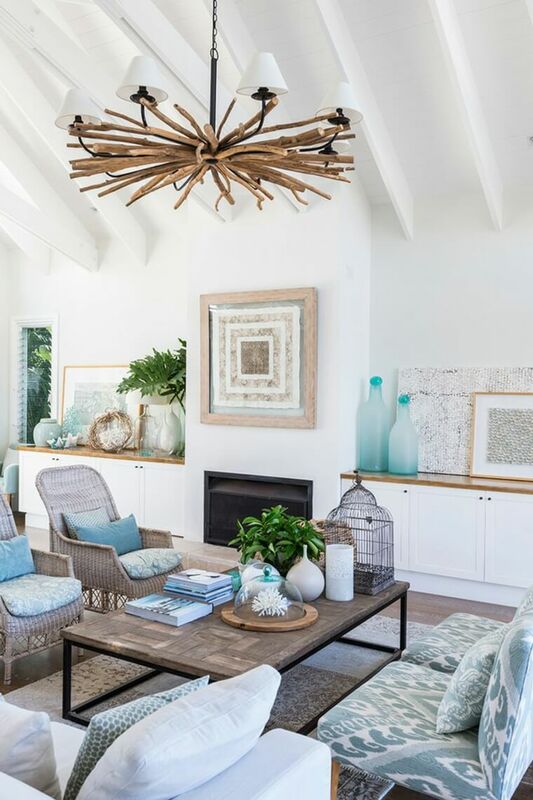 You can round out the look with even more beach decor like starfish. Your guests will marvel at your beautiful table. 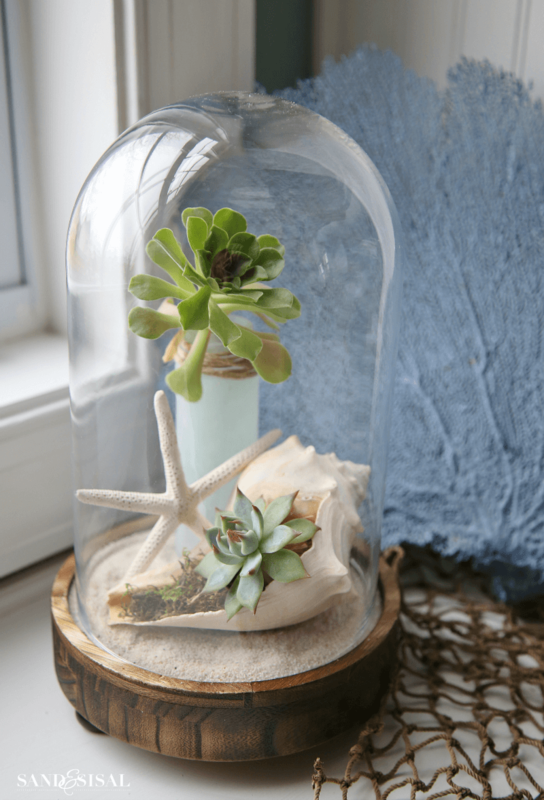 One of the cutest coastal farmhouse design and decor ideas is this cloche that you can easily make yourself. A cloche features a bell-shaped glass enclosing design elements to create a scene. This cloche features coastal elements like a starfish and shell on a gorgeous wooden base. This piece will look beautiful in your living room or bedroom. It’s easy to bring the tranquility of the beach into your home with this adorable sitting area. The table, with its whitewash paint and distressing, and the cute chalkboard have the perfect farmhouse elements. The accents like the sea glass with rope and wicker basket along with the cool blues and whites bring in the beach feel. 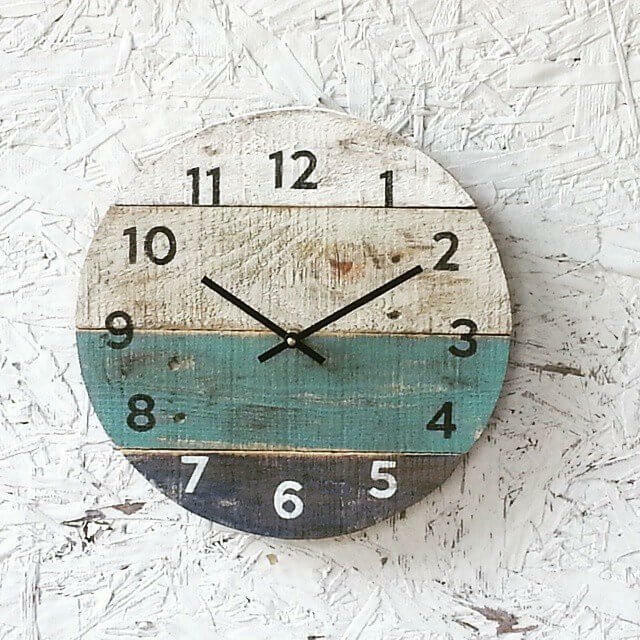 You will always be on beach time with this beautiful coastal style clock made with reclaimed wood. 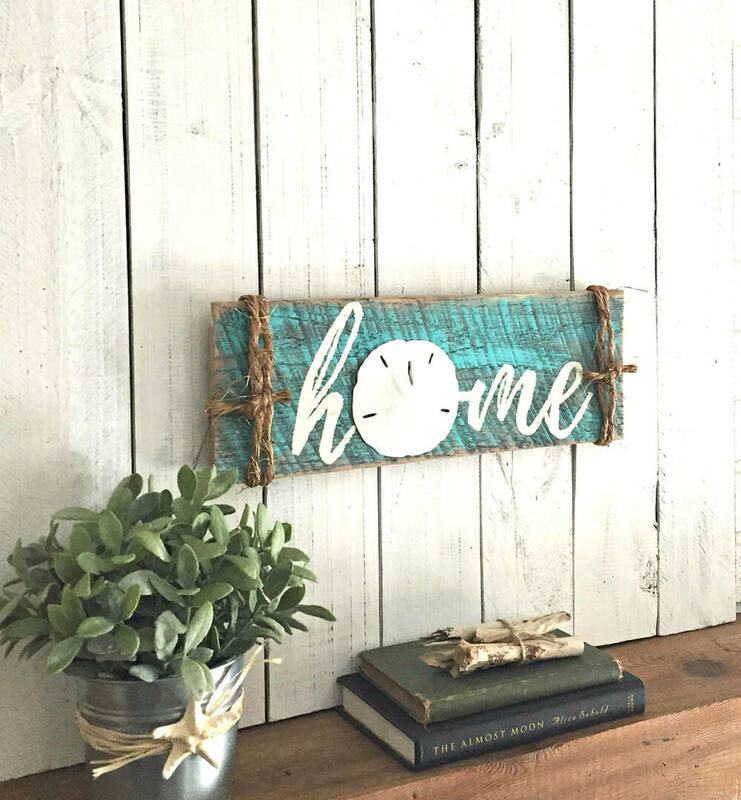 This rustic clock utilizes vintage lettering and shades of neutrals and blues for the perfect blend of the farmhouse and coastal styles. This piece will look perfect in your kitchen, living room or bedroom. One of the hallmarks of the farmhouse style is the mason jar. This beautiful centerpiece features beautifully painted mason jars with unique distressing. The wooden box and burlap twine add to the farmhouse design, while the cool blue hues of the paint add a decidedly coastal flair. This centerpiece will be the highlight of your table. 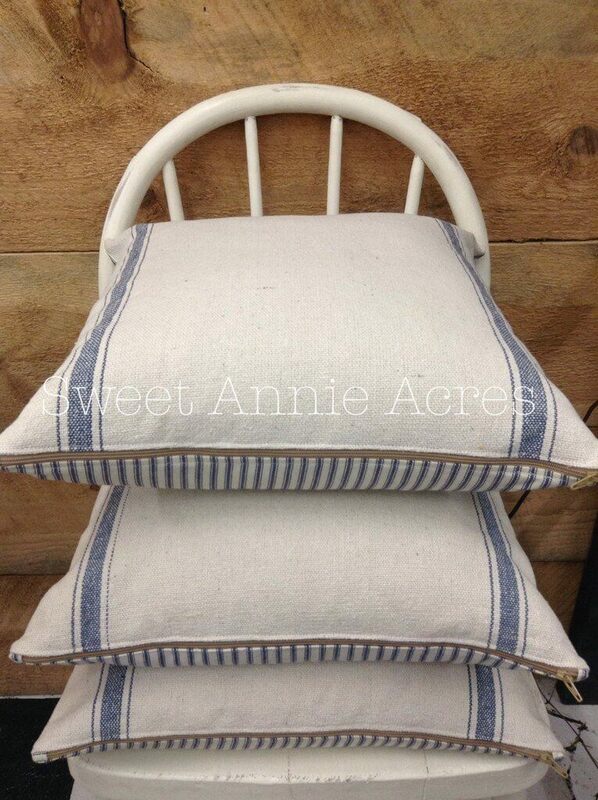 You can easily add details of the farmhouse coastal theme to your sitting area with these pillow covers. Just put them over your old pillows and you will instantly have a fresh design. The covers are made of rustic vintage grain sacks and feature blue stripes that will perfectly accent your room. You can welcome guests into the serenity and comfort of your home with this elegant driftwood wreath that is perfect for your front door or hanging anywhere in your house. You can also use this wreath on a table accent with a hurricane lamp. The base of the wreath is made with driftwood from the Aegean Sea in Greece and gorgeous shells and starfish accents. Home truly is where the heart is, and this sign will be sure to remind you of this sentiment every time you see it. 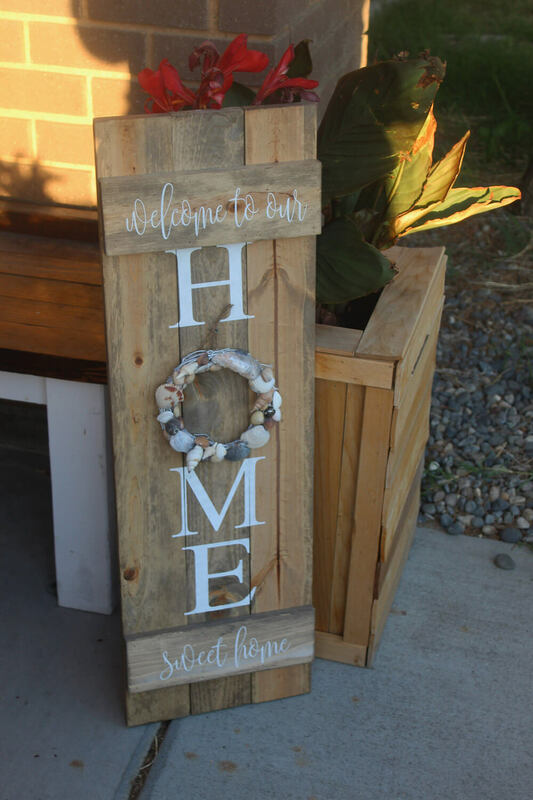 The beautifully stained pine wood and white lettering will add warmth to any room in your home or the front door, while the seashells will call to mind warm summer days on the beach. You can also have this sign customized with a phrase of your choice. 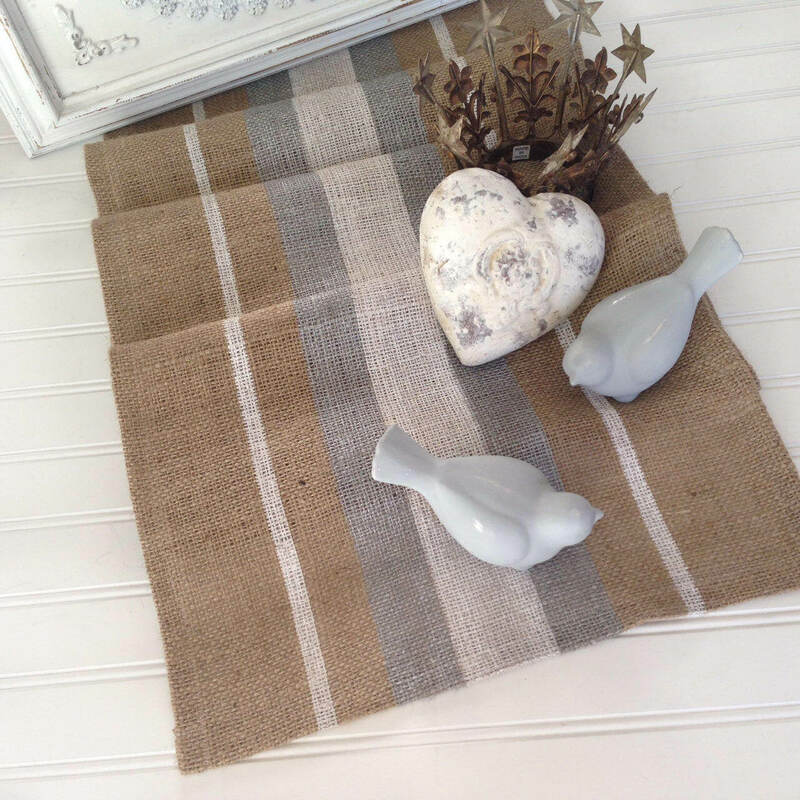 Another of the best coastal farmhouse design and decor ideas to dress up your table is this burlap table runner made out of vintage grain sacks. This runner will look perfect with your coastal decor and the neutral colors will subtle complement your dining area decor. This table runner is handmade and can be customized to any length to fit your farmhouse table. 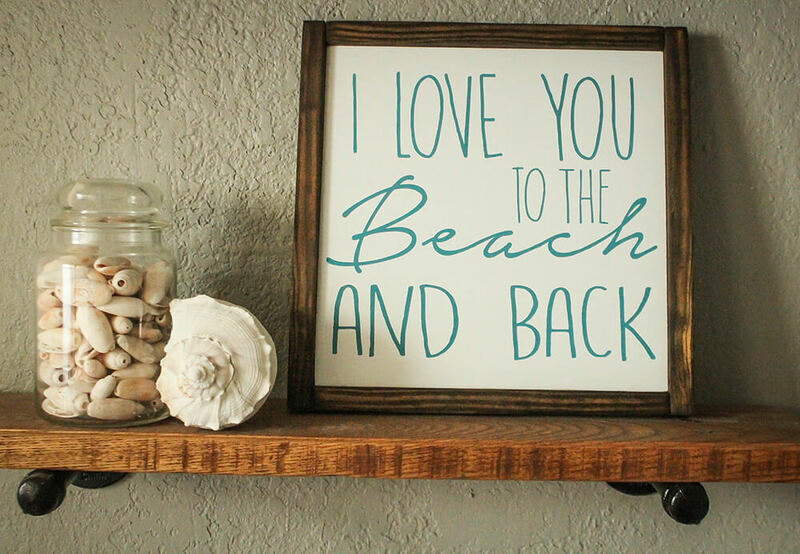 You can bring the cool beach air into your home with this breezy home sign. It is made out of beautiful reclaimed wood. 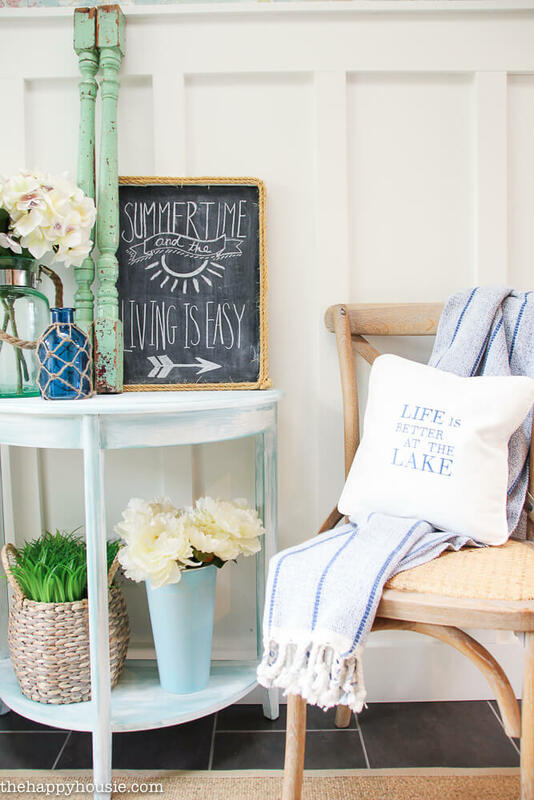 The jute rope and sand dollar accents lend a decidedly coastal feel to your home, while the hand lettering and distressed elements add some rustic charm. This sign will look perfect in any room of your house. This adorable sign is a reminder of how much you love your family – and the beach! The sign is framed in stained wood and is a sweet addition to any room in your home. It will be especially cute in your child or baby’s room. This sign is also available in other sizes, colors and stains, so you can make it perfectly complement any room you choose. Whether you use this gorgeous display outside or inside your home, it is sure to be a focal piece. It mixes farmhouse elements of painted distressed shutters and window frames and coastal echoes of a simple twig wreath. 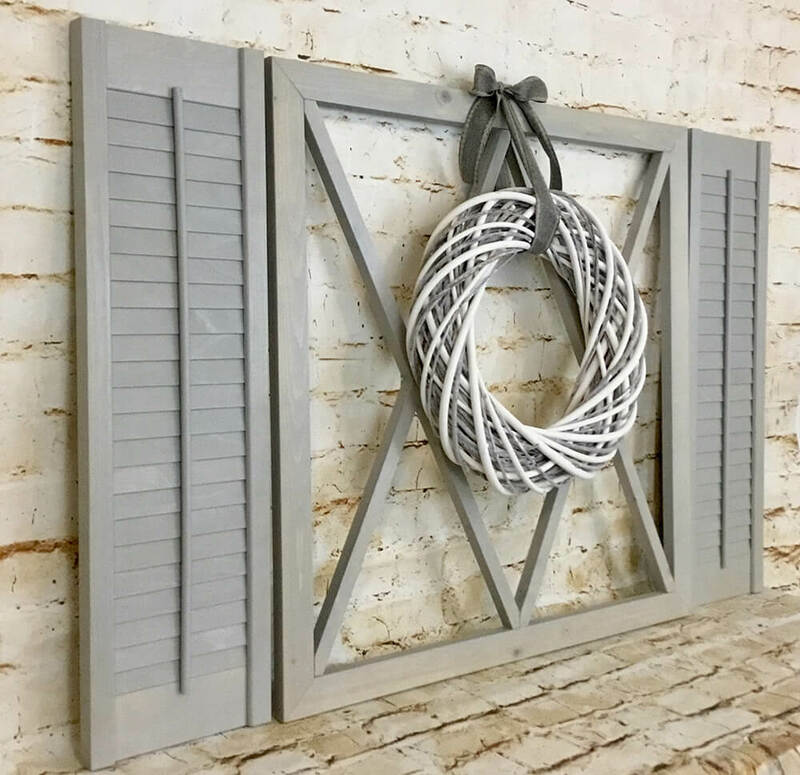 This shutter display can be customized with many different paint colors and can also be made with glass if you are going for a more formal look. This beautiful whitewashed shelf made of reclaimed wood is a lovely place to display some of your favorite coastal accents. 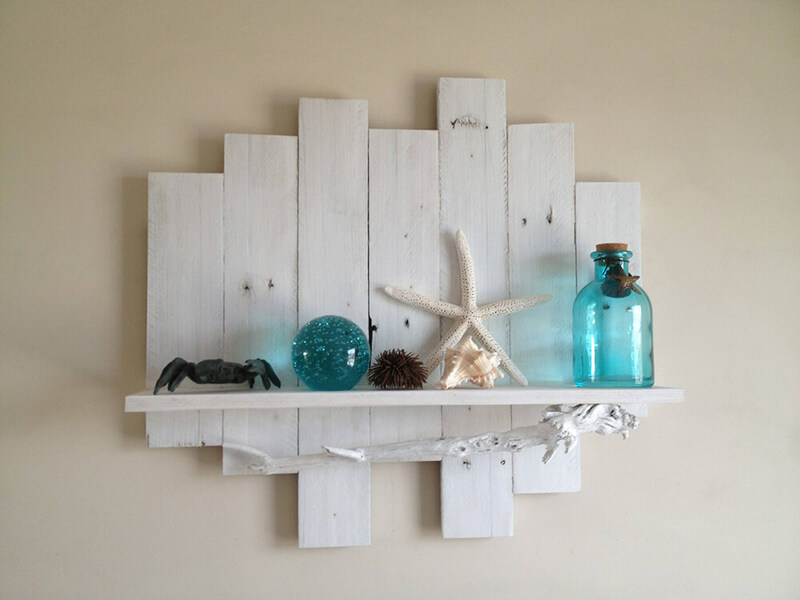 The pallet wood perfectly embodies the farmhouse style, and the driftwood adds beach charm. The shelf is customizable with different colors and can be made without the driftwood if you want a more simple look. You can also request custom sizes if you need something bigger or smaller. To bring some beautiful beach hues into your home or onto your front door, consider this burlap fabric wreath. 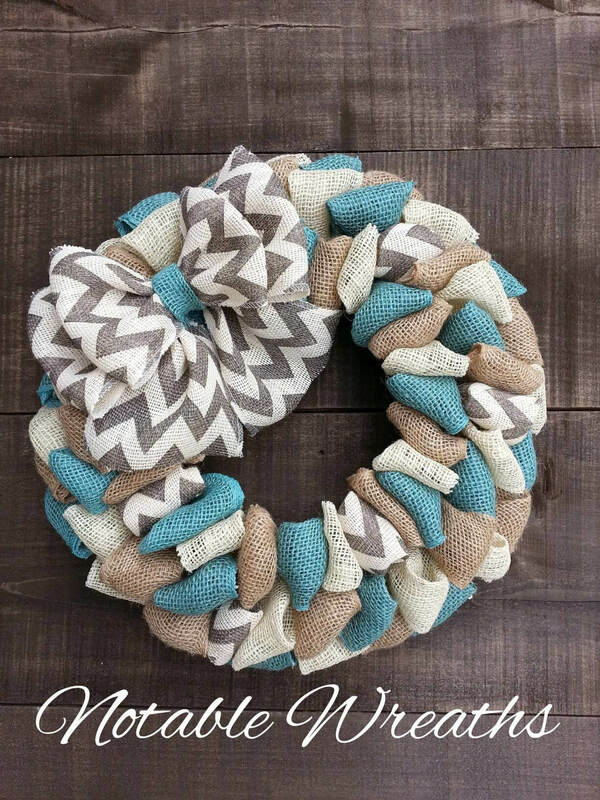 This wreath is intricately woven with various colors of burlap, including neutrals, whites, turquoise and accents of chevron. The wreath is sure to add warmth to your living area or bedroom. If you have a breakfast nook in your kitchen, this sweet farmhouse table will liven it up and give your family a cozy place to stop for breakfast. The table is made of rustic Douglas Fir and has the perfect farmhouse feel with a stained top and whitewashed bottom. 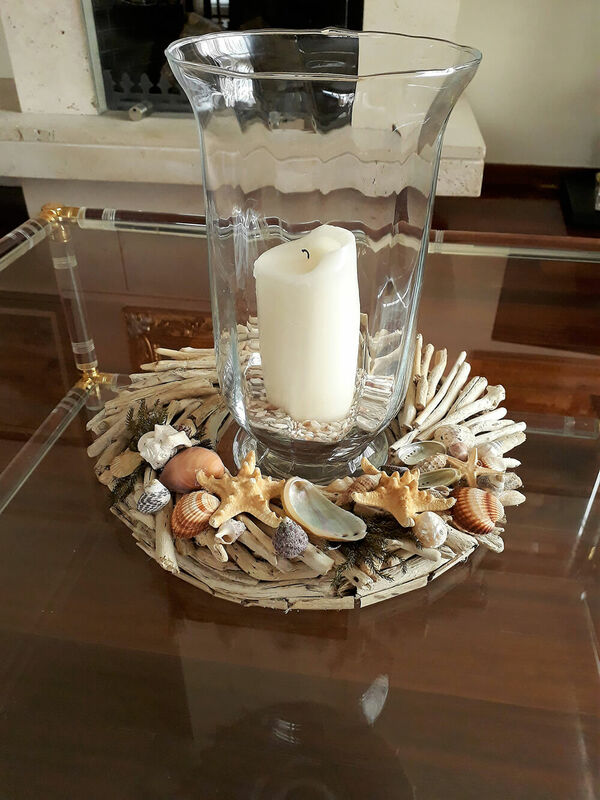 To bring in a coastal element, use some beach accents to create a centerpiece. Add some vintage chairs and you will have a beautiful breakfast nook. 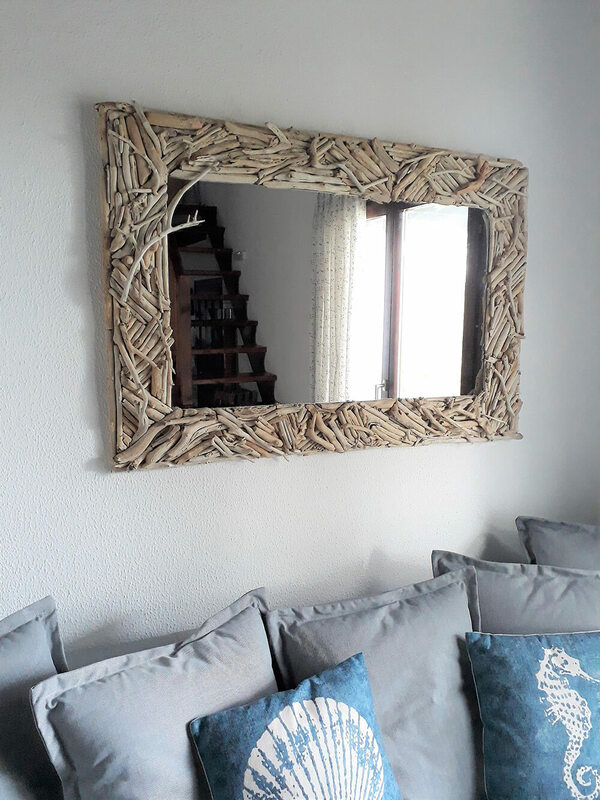 This beautiful handmade mirror is a wonderful accent to any room in your home. It is made with driftwood found from the Grecian shores of the Aegean Sea, making it an excellent conversation piece for your living area. Each of these mirrors is unique, making it a special piece for your home. When decorating your home in the coastal farmhouse style, you don’t want to forget the bathroom. 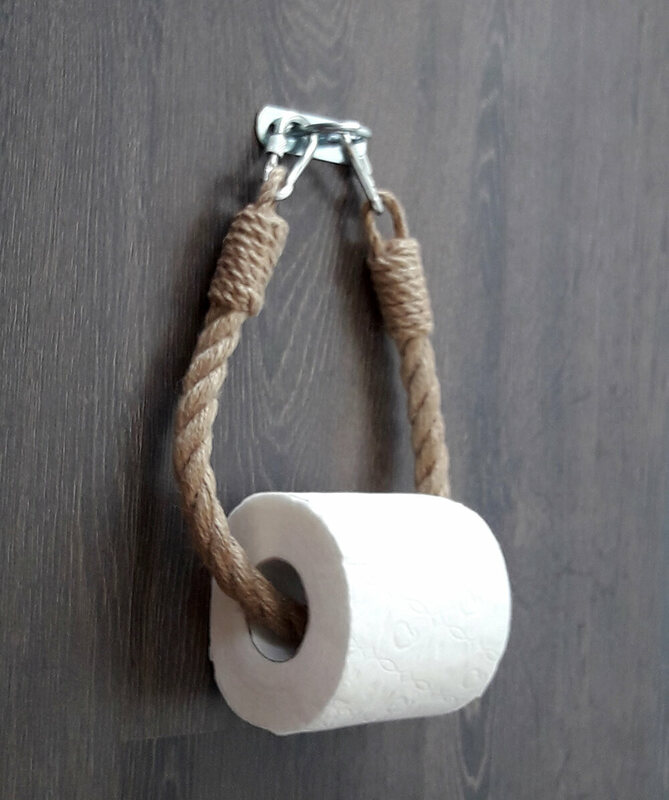 This simple jute rope toilet paper holder is both cute and functional. The metal hooks add an elemental of the industrial style while the whimsical knotting lends nautical charm to your bathroom. 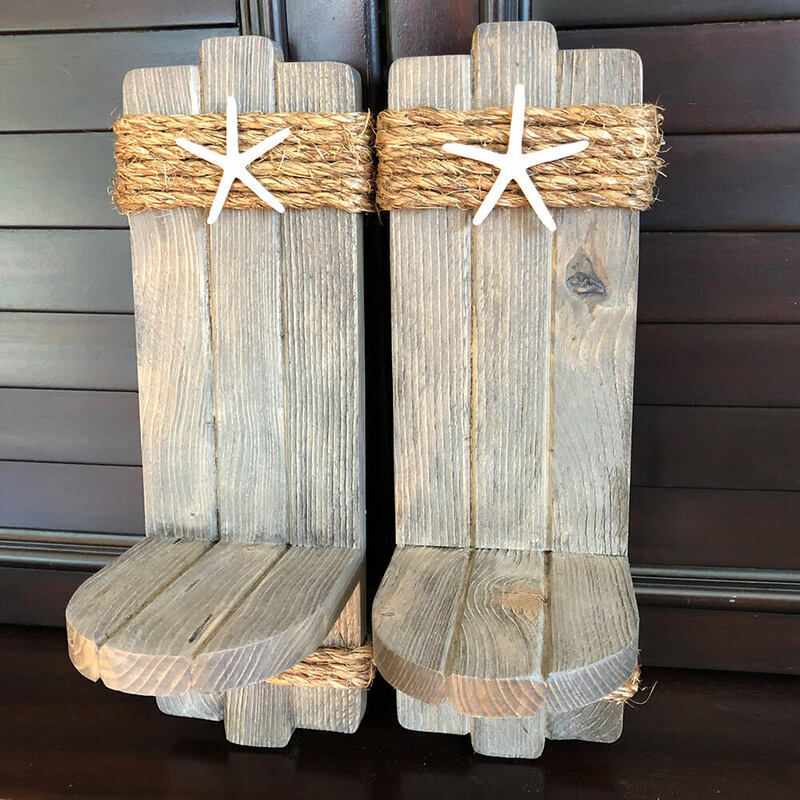 Another of the best coastal farmhouse design and decor ideas is this shelf that is both functional and adorable. 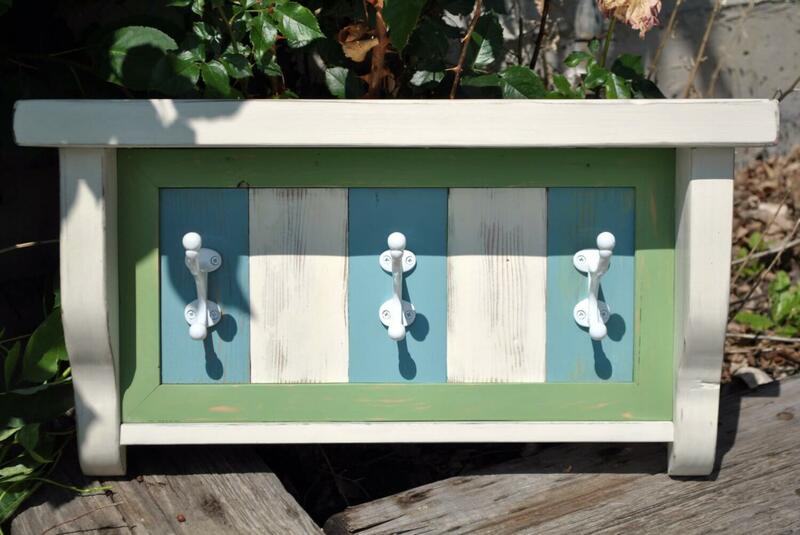 It is made with reclaimed wood and painted and distressed with chalk paint. You can top it with coastal elements and use the hooks to hang your favorite swimsuit up to dry. This shelf will look great in your entryway, mudroom or laundry room. This cute flock of seagulls while have you feeling the sea air in any room of your house. 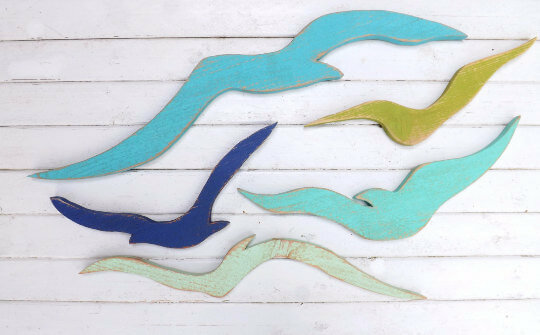 These seagulls are made of reclaimed wood and hand cut. The array of hues will perfectly complement the beach decor in your home. For an added farmhouse feel, hang these seagulls on a wall made of shiplap. 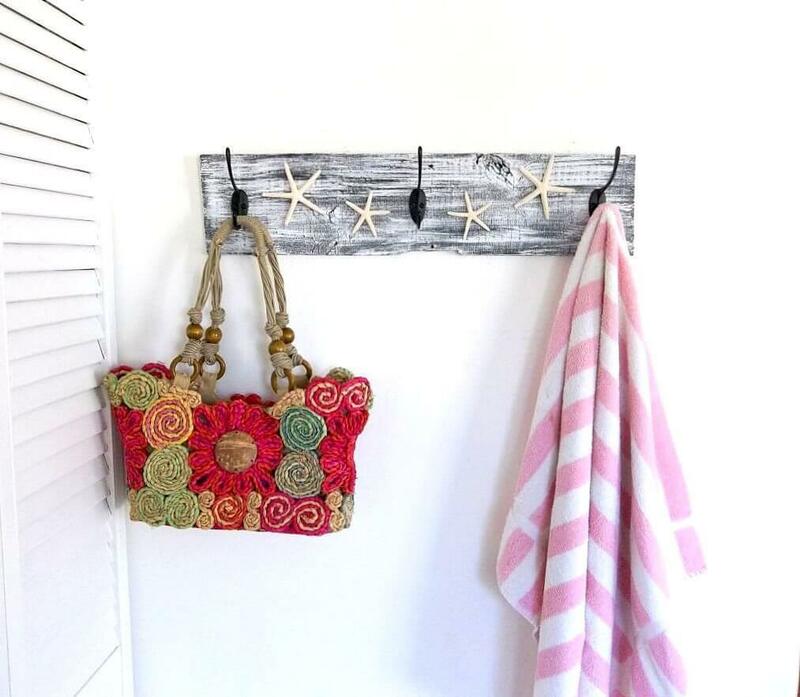 Any home with the coastal farmhouse style needs a place to hang your towels and beach bags, and this rustic towel rack is perfect for the job. The base is made of painted reclaimed wood and contains black metal hooks, both bringing the modern farmhouse feel. The seashell embellishments add the perfect flair for that coastal look. 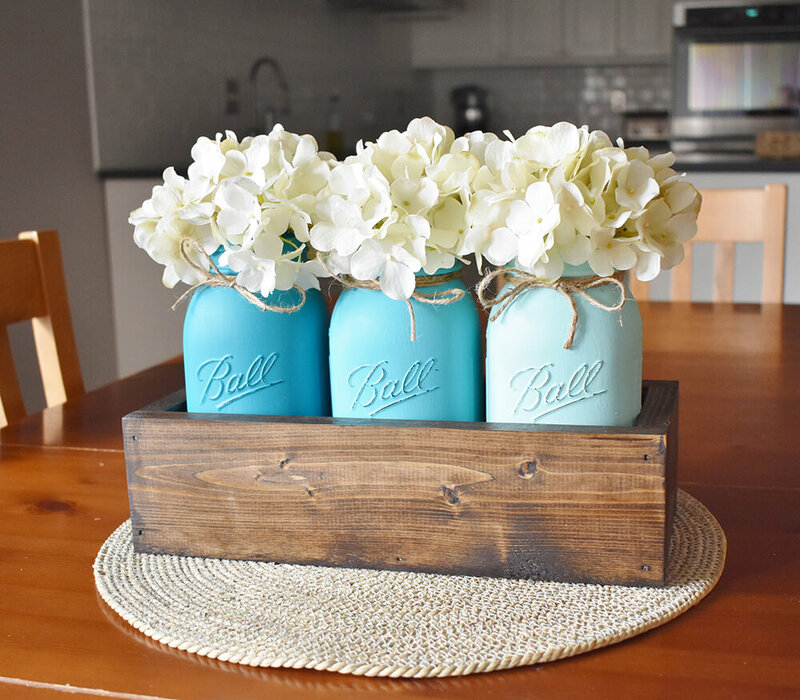 This three-piece set includes two painted mason jars and a wooden create. 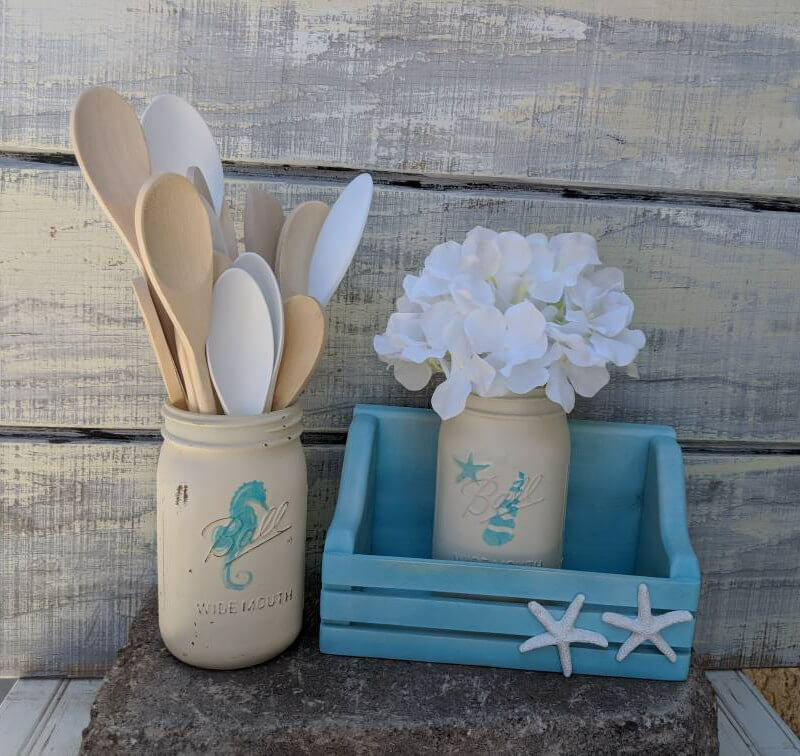 The mason jars are painted on the outside and have cute seahorse, shell and starfish embellishments that are also hand-painted. This set will look perfect on your kitchen counters. The jars are great for holding utensils or dry ingredients, and the crate can store kitchen linens or cookbooks. One of the most basic elements of both the farmhouse and coastal styles is the vintage glass bottle. This set of 17 bottles is perfect to get you started on your coastal farmhouse decor. 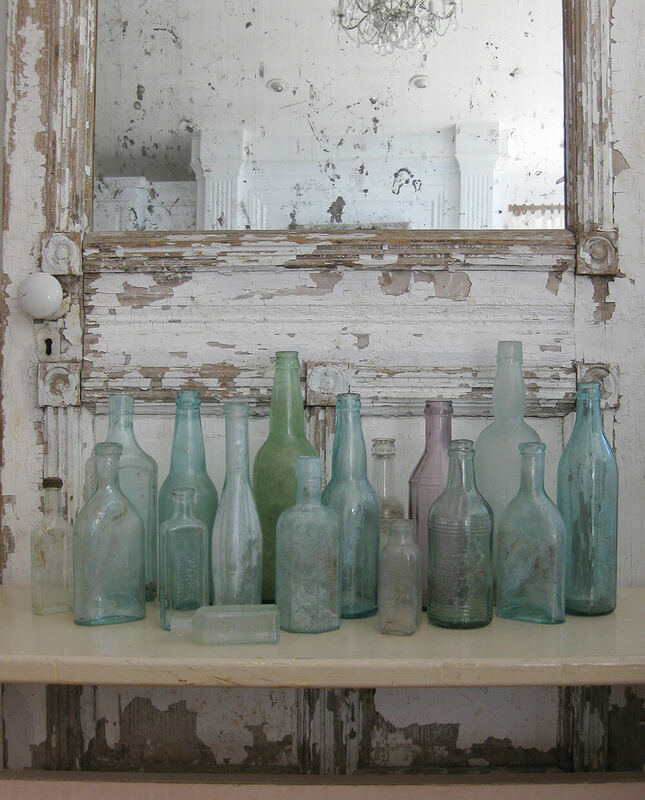 Each vintage bottle is unique and the set comes in an array of colors and patinas. These are the perfect accent for any space in your home, including mantles, bookshelves and kitchen counters. While these bottles are beautiful on their own, you can add to them with flowers, string and more. A few lit candles can brighten up any room. This pair of wall sconces are made from reclaimed wood that has been stained and distressed. The sconces feature jute rope and starfish to bring the beach into any room of your home. Add a set of elegant white candles to complete the look.